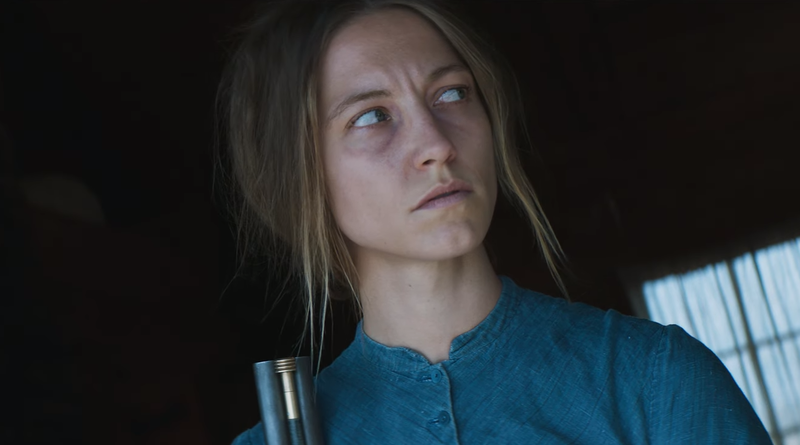 The Western genre leans heavily to the masculine side but in recent years we've seen an increased focus on the plight of frontierswomen in movies such as Jane Got a Gun, Sweetwater, and Meek's Cutoff. The horror-Western is a new twist on this trend, with Emma Tammi's festival darling The Wind an ominous slow burn with impeccable sound design that cuts sharp like a knife. While Tammi's technical skills are beyond reproach, dramatically the film stumbles along like a dusty old tumbleweed. The creep factor sets in early as two Old West men watch helplessly the bloody repercussions of an unseen trauma. A woman exits an isolated home drenched in crimson, a baby in her arms. You only need to hear the anguished wails of one man to know the pain of his loss. Screenwriter Teresa Sutherland mixes up the timelines in capturing the story of Lizzy (Caitlin Gerard), a 19th-century homemaker living in a remote home with her husband Isaac (Ashley Zukerman). Out here in the middle of nowhere it's possible to not see another soul for hundreds of miles, so Lizzy spends most of her time alone doing household chores while Isaac is off for days at a time. The loneliness, and Lizzy's restlessness is palpable, which is why she's so excited to learn of another married couple that has moved in nearby. Lizzy welcomes the seemingly sweet-natured neighbors, Emma (Julia Goldani) and Gideon (Dylan McTee), but it doesn't take long before something about them rings false. Sutherland deliberately keeps us at a distance from everyone, leaving us to fend for ourselves in figuring out any possible deceptions. It's not just in the newcomers, either. As the timeline bounces from the families' earliest encounters to the present, we see that Lizzy is also being haunted by what appears to be a demonic presence. But can even that be trusted, or has the desolate landscape, Lizzy's issues with abandonment and motherhood begun to play tricks with her head? 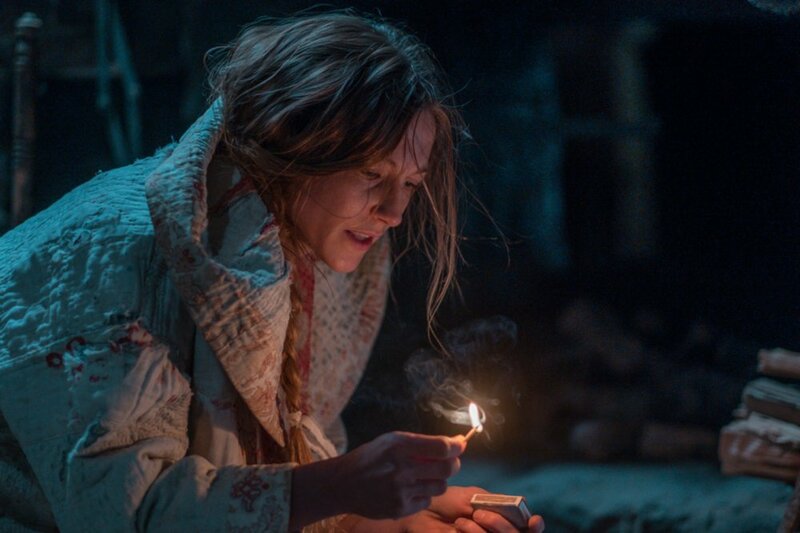 Heavy with gloomy atmospherics that capture the irony of Lizzy's despair; her sense of claustrophobia in the wide open frontier, The Wind will grab the attention of fans of other slow burn horrors such as The Witch and The Babadook. But it isn't those films and can't maintain a steady sense of dread throughout. Although the film runs for only 87 minutes it feels quite a bit longer as stretches play out in dismal fashion, with little to no mounting tension. The best moments find the brilliant Caitlin Gerard left to her own devices, depicting Lizzy's struggle with a paranormal force she's both terrified of and enamored by. It's in these scenes that Tammi's masterful use of sound is undeniable. Every gust of wind is like a living, breathing thing whispering horrible things into your ears. We can't help but feel Lizzy's growing anxiety, with Gerard delivering a complex performance that shows the full range of her talents. The Wind might have done better with a more linear approach that keeps the feminist viewpoint and builds to a properly spooky crescendo. Tammi is a director to keep an eye on, however, and perhaps the next project will be able to match the skills she has in abundance.